I knew this blog post title was a terrible metaphor. But once the metaphor took a hold in my brain, it would not let go. And then I am in Photoshop, mashing up a collage of assorted images from web sites that do not provide the source of the same image (see the end of the post for the story behind the image. But much of the web, social media, is a huge conveyer belt where we move, take, toss media that have no sourcing, no mention of where they came from, no context. I have no illusions this will change. But I will not be part of the consumption and production of Soylent Media. And while I can feel lonely as an attributor (not as desolate as Charlton Heston’s portrayal), once in a while, an indication comes through out of the blue. I’m not alone. As an aside, it’s interesting when I embed that as the tweet where I found it, rather than just the image itself- the tweet has attached a time stamp and the name of the person who shared it. Kind of metadata-ish, though not of the media. Because mostly in social media platforms, we just shove around images or reblog them in tumblr with no vestige of a beginning. In my post I did a bit of detective work to find the likely source of the education bike. Because otherwise, it just keeps going with all the other piles of images, down the belt. As reddit goes, it was just shared. Down the belt. And by that time un my post, I got tired and wrote “I’ll be damned if I’m going to go look for the source of that (well not tonight)”. CogDog FYI, I wanted to pass on the Krebs cycle image & looked for attribution. From the style it probably originated (http://bit.ly/2kRZ7vl) from this University of Sheffield page http://www.deconstructingthetour.group.shef.ac.uk/krebs-bicycle/, though it’s sinced been hacked by the busy Peshmerga sympathiser ‘ SA3D HaCk3D ‘ and it looks like the image has been replaced. PS. 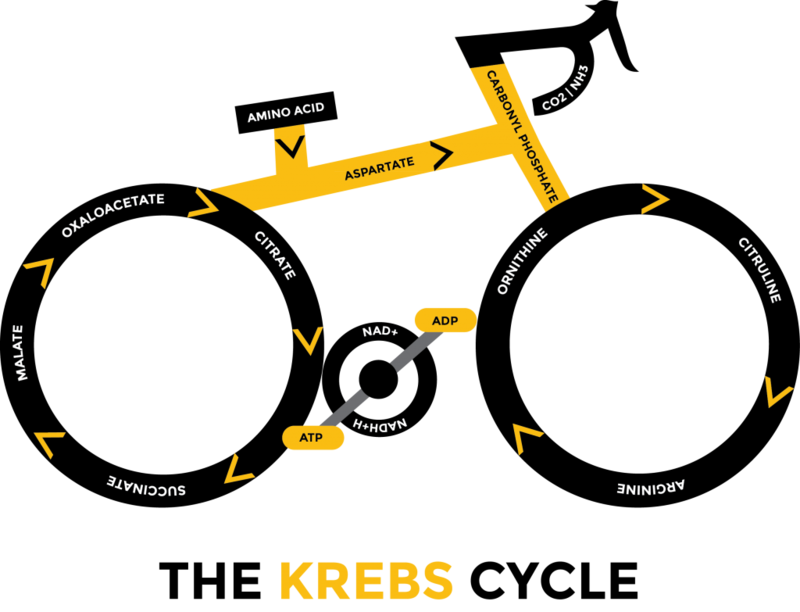 The Krebs Cycle image was created by @_atwist from Sheffield University who doesn’t ask for attribution (and he’s also updated the WordPress version, killing the hack). 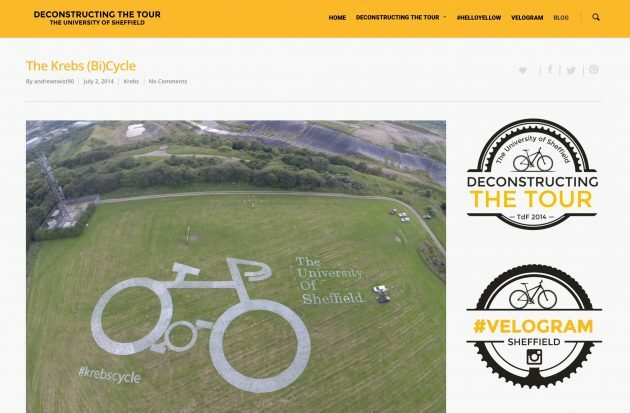 Apparently in 2014, Sheffield University used the proximity to the Tour de France for some educational purposes, with a site about Deconstructing the Tour. The bicycle will also illustrate the Krebs cycle – the process by which mitochondria, the tiny “power stations” of the cells, turn food and oxygen into the energy needed for exercise. Local school children will play the part of molecules in a re-enactment of way the Krebs Cycle works on the field. This is the payoff of digging for sources, the magical, unexpected rabbit holes you find yourself in while finding sources. The Sheffield site, doing education around a bicycle event, reminds me totally of the Great VCU Bike Racebook Project at VCU that I was a small part of. Attribution is less interesting and compelling when it’s about following rules and letters of licenses. It’s when someone like James jumps in and helps close the gap. See it’s not about automated blockchain tracking of reuse– it’s Soylent media. Featured image: A collage of images for which none have open licenses, this is to make a point. But it is for the purposes of education/commentary, a dash of parody, a heavier dose of irony, and of course on this blog, blatant non commercialized purposes. The scene from the 1973 movie Soylent Green is a single frame among many, maybe one of many clips from the many of movie on YouTube. I found it on a Nerdist post about the movie. I did a little trick to replace the conveyer belt, too lazy to reproduce the original– filled the corner area with a dark green, added gaussian noise in Photoshop, and a motion blur in the direction of the belt. The strewn photos are from a pair of random images, one from a site for a home decorating show the other from a blog post about saving old family photographs — all of them masked, rotated, duplicated. On none of these sites are the sources of the images used the published web pages credited or attributed. Love the title for this post. I think it is absolutely appropriate! *woof* Nice follow-up post CogDog. I Tried Twice to Rent an HD Movie on my iPhone, And You Would Not Believe What Happened Next!